MT Services Limted > system tips > Four simple steps to receive less spam! 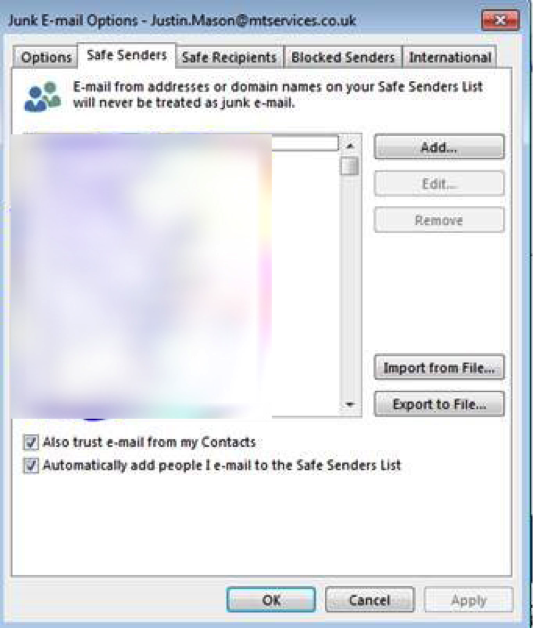 Adding people to the safe sender list means you can generate a list of senders that you consider safe to receive e-mail messages from. This means, when you receive an e-mail message from a sender that is from the trusted list, that e-mail message is delivered directly to your inbox. This can be done manually or automatically, as the following steps will explain. Important: Although you may have activated a ‘safe sender list’, it is still possible to receive unsafe e-mail messages that can do damage to your computer. Click on Junk from the drop down box on the top toolbar. 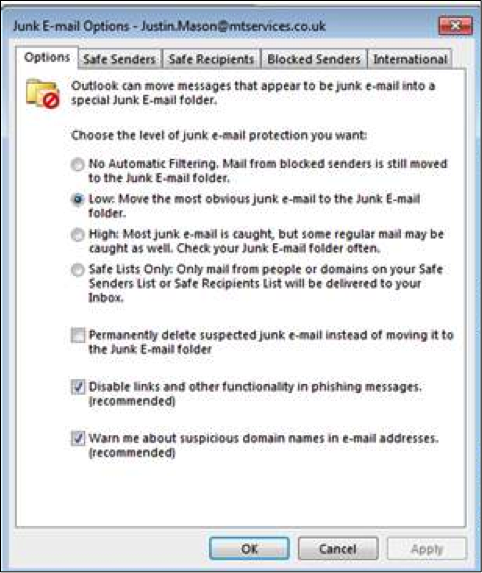 Select Junk email options. This will open a new window which shows your junk email options. Here you can choose the ferocity of the spam filter. Choose the next level down on your spam filtering options. Choosing no filtering could cause an influx of SPAM. Click on the Safe Senders tab at the top. If you wish to add any domains/emails to the whitelist click add. To add a domain you must have a preceding “@” before the domain name, e.g “@mtservices.co.uk”. Tick both the corresponding box which states – “Automatically add people I email to the safe senders list” and “Also trust email from my contacts”.